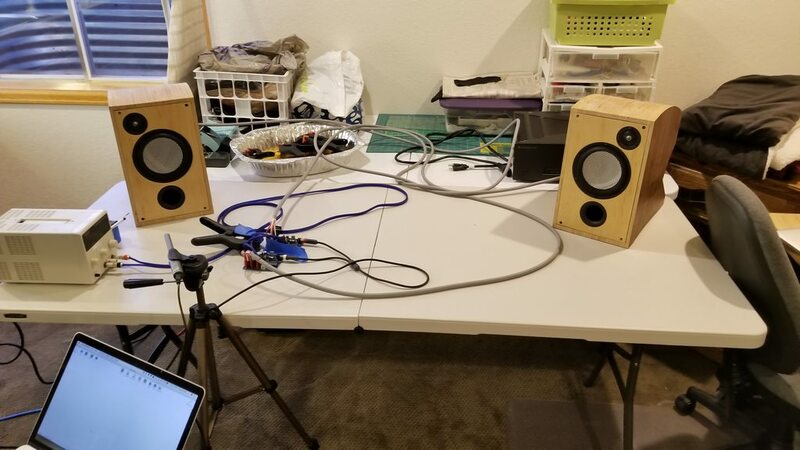 Hello diyAudio, since I am coming close to completing my Anvil bookshelf speakers and custom active crossover/amp module I thought it would be a good time to generate a build log. The last remaining step is reassembly and testing after the polyurethane dries. This is a long post. I am sure, like with all DIY designs, there is room for improvement. 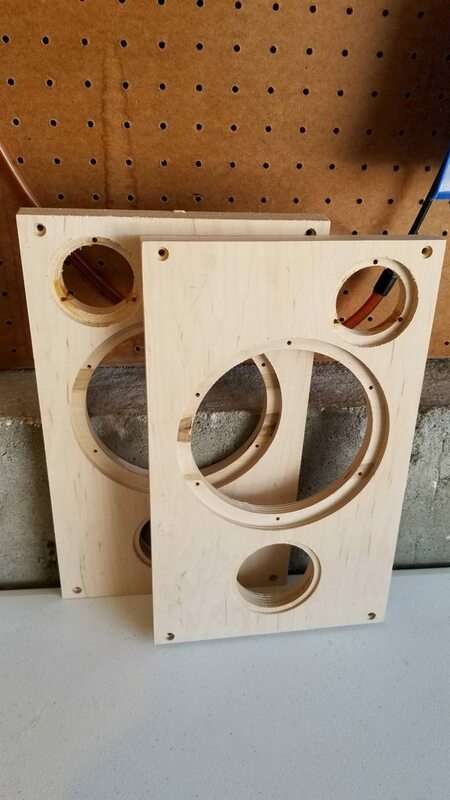 This is the first speaker I have made, but have the benefit of experience drawing from my father who has been in the audio hobby since I was born. 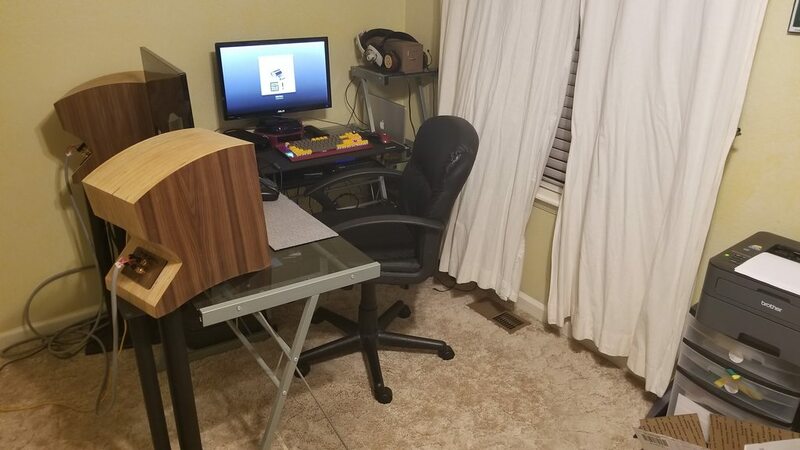 The goal here was to build a set of bookshelf speakers focused on stereo listening at a desk, but capable of being used in a small living room later. I began by looking at transmission line designs and made a full design. 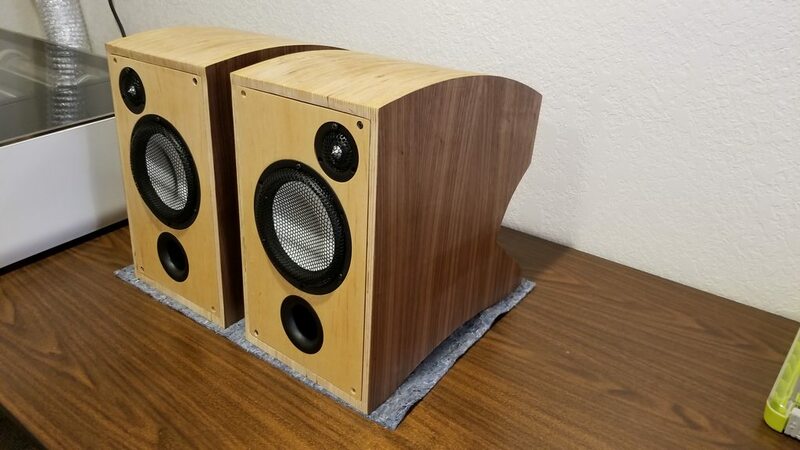 The issue was, for the size, my measurements showed more bass extension was available from the same sized cabinet if we used a more traditional bass-reflex design (since a small bookshelf TL only allows for a small driver). 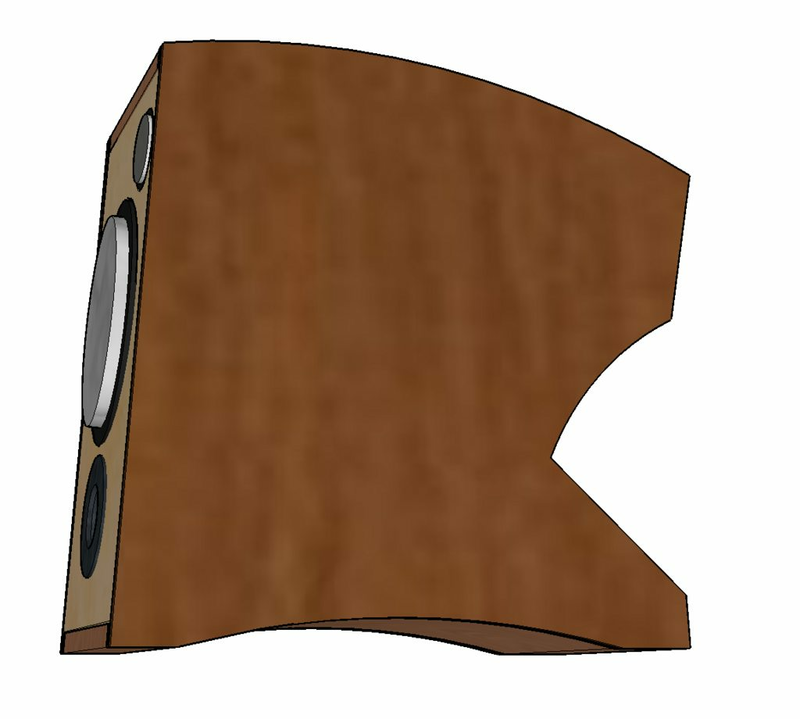 So I scrapped the TL idea and went to work designing a bass reflex style speaker. We chose the Accuton C158-6-85 for its good mid/bass characteristics, fairly flat response, known bass reflex design, and because we have been impressed with all of the Accuton ceramics we have used. The tweeter was a little more of a challenge since we have minimal baffle room and wanted to cross a little lower. Due to cost, the Accuton ceramic tweeters weren't an option. The Scanspeak Illuminator R3004/6020-10 was chosen since it would crossover well with the Accuton, fits the baffle, has good frequency response, and also matches the visual style of the Accuton. I started by making a 3d design. 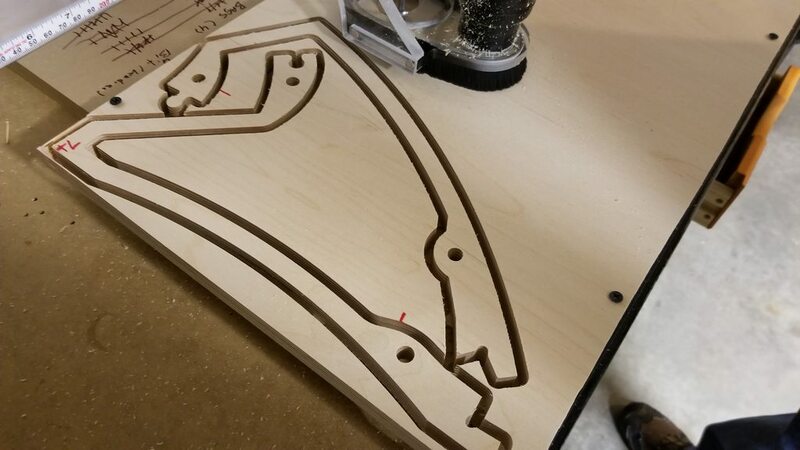 It was important to make the design no greater than 15" in any direction so that I could cut the parts on the CNC machine and some on the laser cutter. 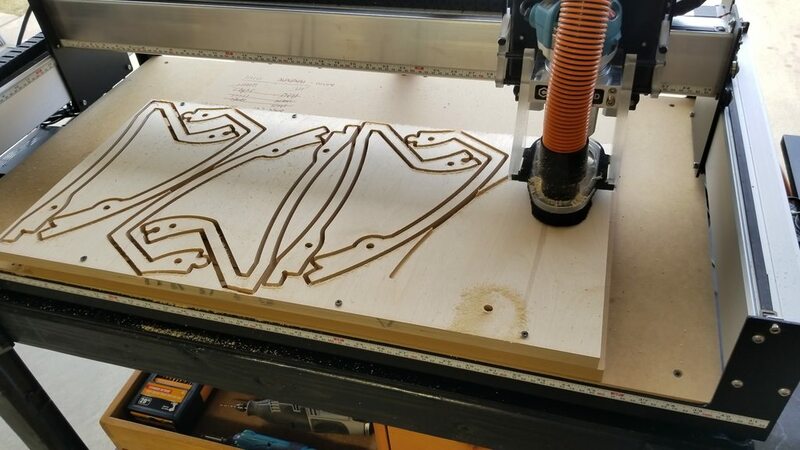 Since I was planning to use a CNC machine, I wanted to make a design other than a rectangular box. 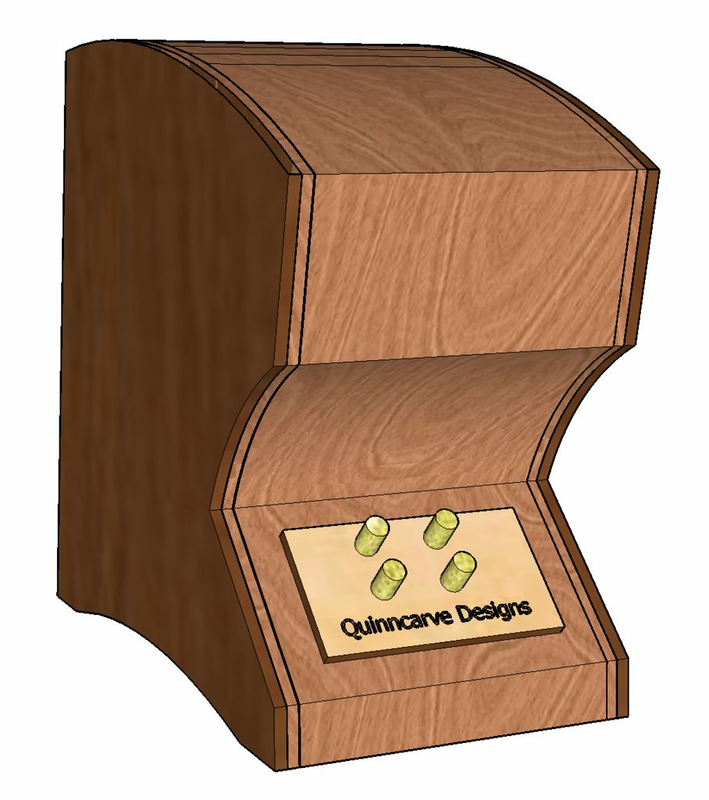 The cabinet will be made using slices of birch plywood with walnut veneered sides and a maple veneered removable baffle. These will use an active external crossover so I did not leave room for the crossover internally. Using SketchUp's area tools I calculated that this design will have an internal volume of almost exactly 15L (prior to installing drivers, which will decrease the effective volume). The port chosen also exactly matches the recommended length and diameter. I then designed the slices to be cut. The walls were made to be just over .5" thick all around. In order to waste less material I divided each slice in half, so they can puzzle together and be joined by dowels. Everything started out exactly as planned. 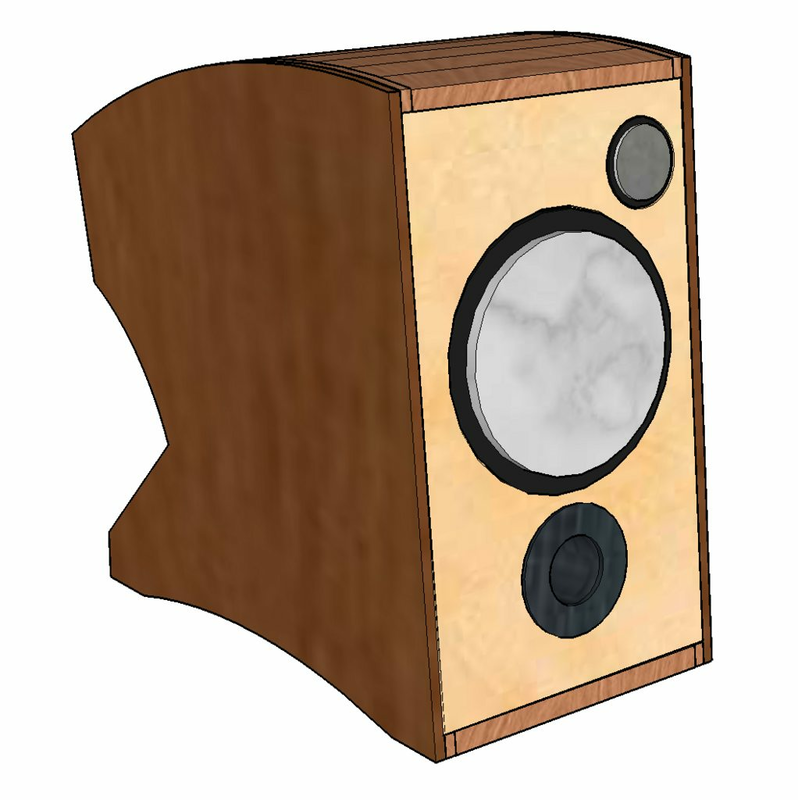 I would need ten slices per speaker, meaning 40 parts in total. I could get 8 parts from each sheet of material. 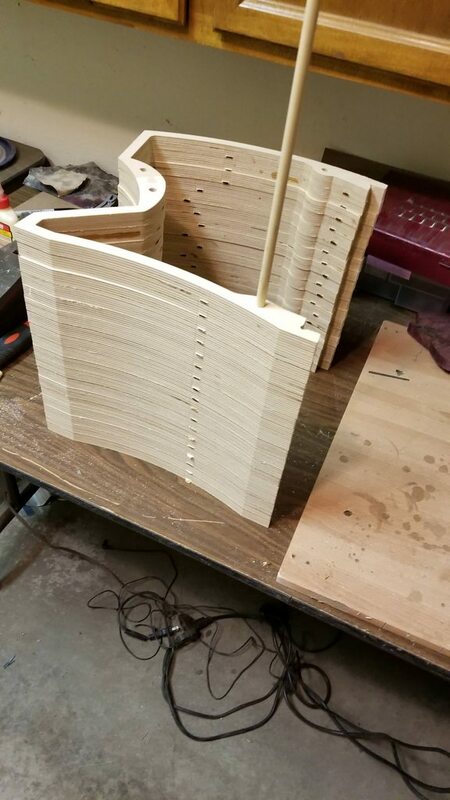 We don't run very aggressive feeds and speeds so each sheet took about 35 minutes of CNC time. 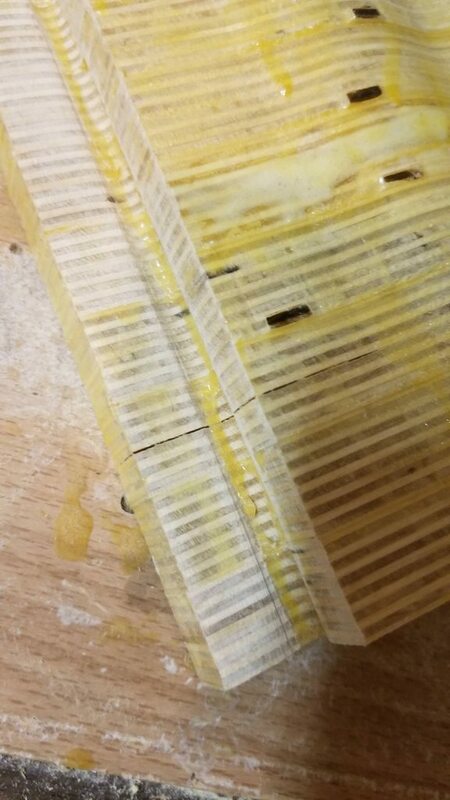 We ran into trouble when we realized that some of the birch ply we purchased was defective. 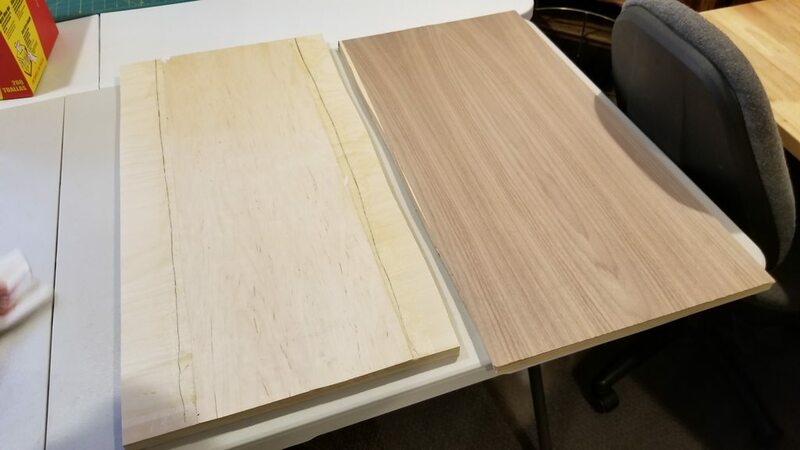 Though we bought cabinet-grade plywood, a portion of the sheet was not properly glued. A few of the parts delaminated completely and we needed to recut them. When we built a much larger set of speakers in the past this was not an issue, even using the same supplier. After a full day of cutting we got all of the slices done. 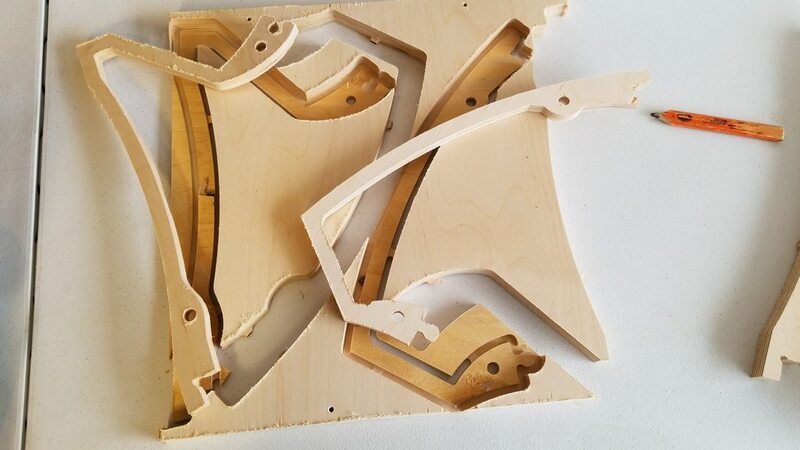 The puzzle pieces were a good tight fit so they were pounded together. You can see in the third photo why I named it the Anvil. I inserted the dowels, applied glue, and clamped. The dowels were a tight fit so alignment was pretty easy. The dowel construction makes them very strong. 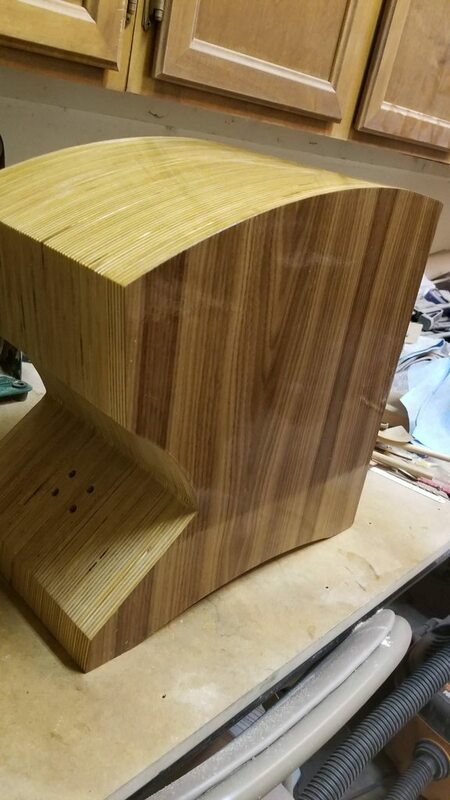 Both inner sections glued up and insides sprayed with shellac to seal. 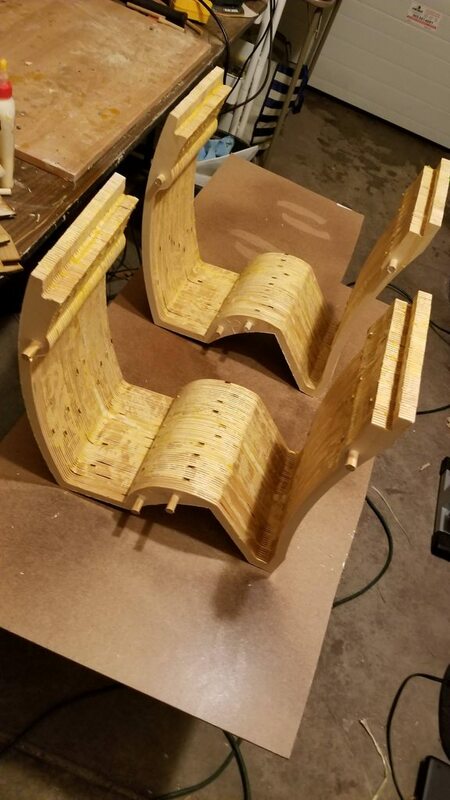 I did not make the insides pretty since they will be covered in material and wont be visible anyways. With the main "C" underway it was time to work on the baffle and sides. 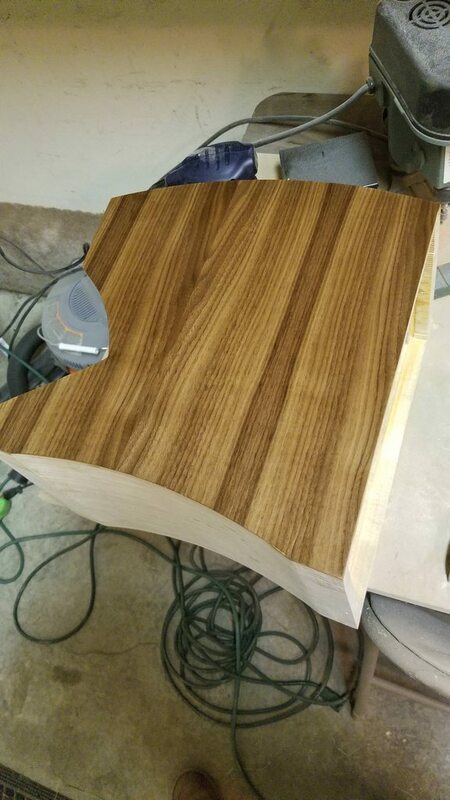 We veneered one sheet in maple for the baffles and two others in walnut for the sides. 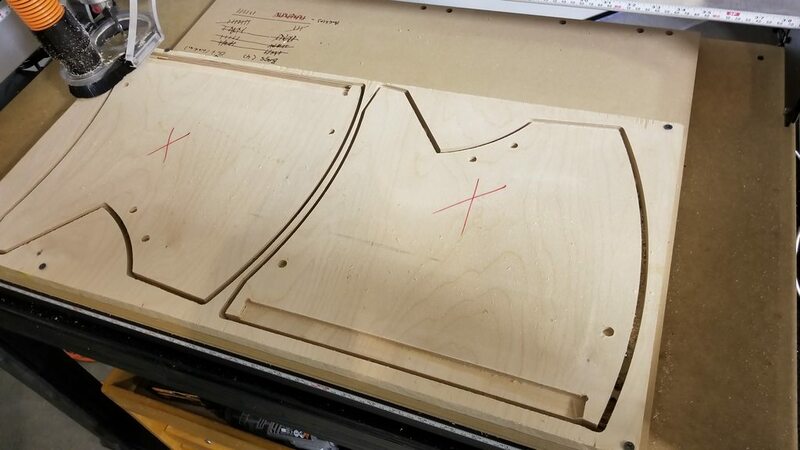 The sides were cut face-down to allow us to mill a pocket in for the baffle to sit and pocketed holes to allow for hidden dowel alignment. The baffles were designed so that the drivers and port would mount flush to the surface. The delamination began showing up over time on parts that previously looked like they were solid. These cracks would be sealed with a glue-sawdust mixture on the outside and gorilla glue on the inside. 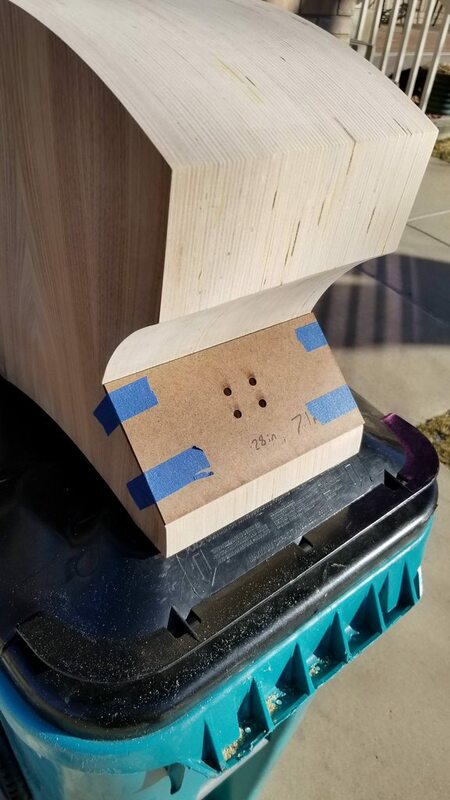 The boxes are very stable even with the filled cracks, in part due to the dowel construction. After getting the cracks under control I sanded the boxes down smooth so they would be ready for finishing. 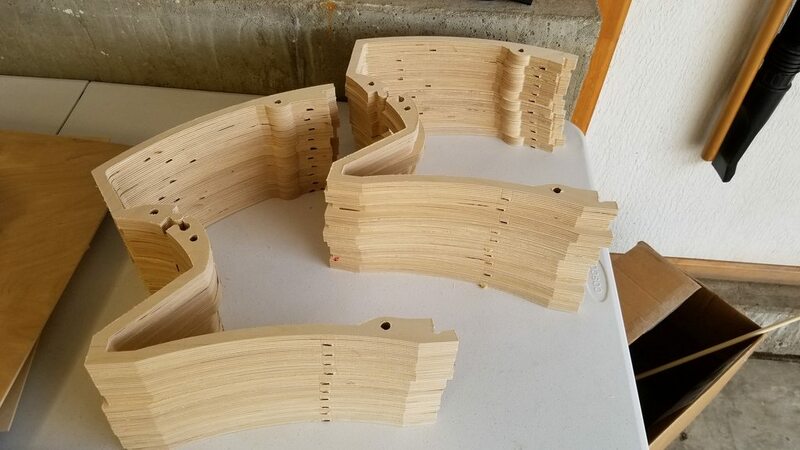 Now that the boxes are in their finished shape, we are ready to drill holes for the removable baffle inserts and binding posts. 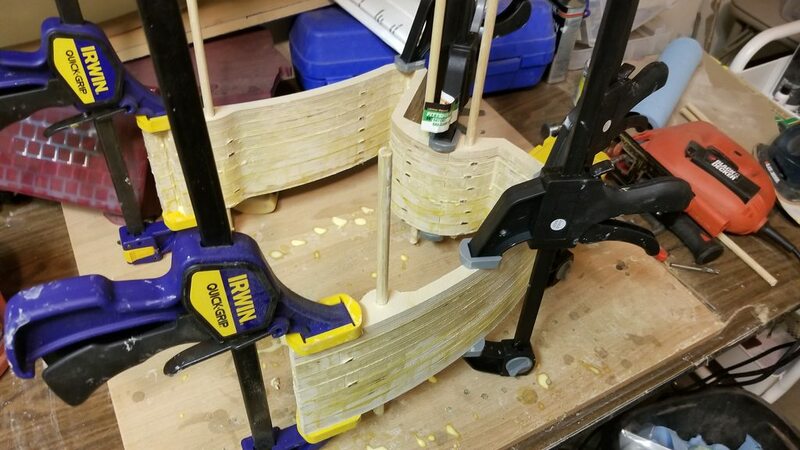 Rather than eyeball it, we cut drill jigs using a laser cutter. First time test-fitting the drivers and port. Everything fits like it should and looks good together. I then put a base coat of polyurethane on the entire box to help seal it. 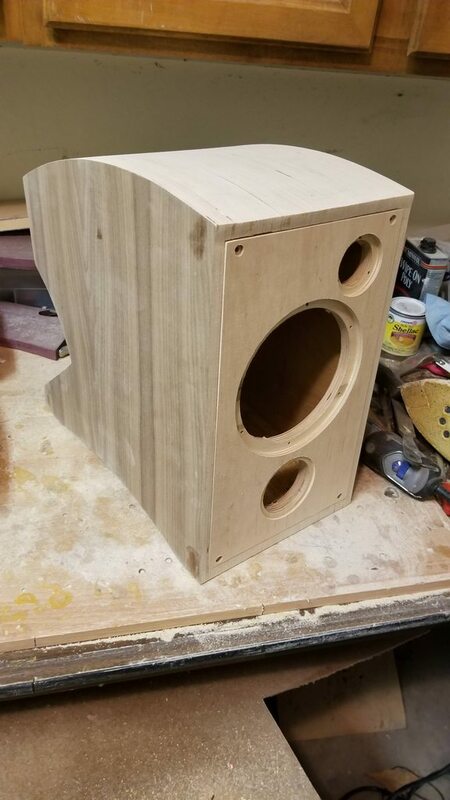 This won't be its finished look (it will have a thicker and glossier finish when done), but will be enough to seal it while it is hooked up to test how it sounds before dedicating more time to finishing. After allowing the first sealing coats to dry, the inside was dampened. The sides have not yet been done, but will be. The material is glued in with contact cement. Capacitors wired in-line to protect the tweeter. Drivers temporarily mounted and wired. Without the final finishing, but otherwise assembled. Its satisfying to finally see them assembled after several weeks of building. Initial testing to make sure the speakers perform like we want prior to doing some of the finishing work. 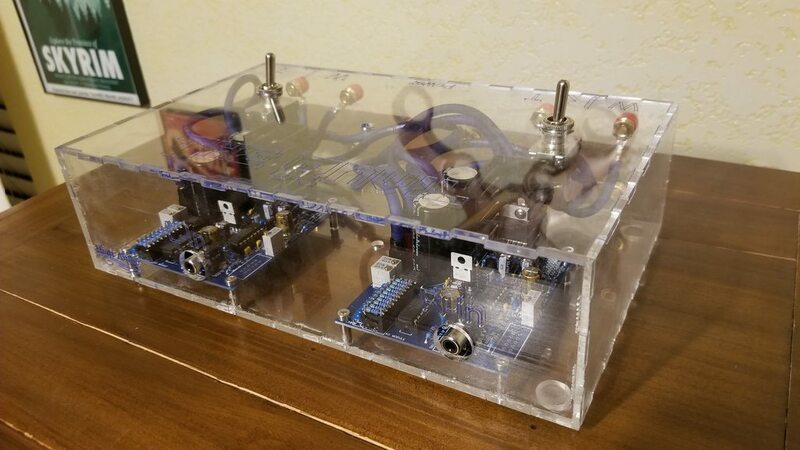 Since this is an active crossover design and the amplifier/crossover box still needs built, they are just loose boards for now. The speakers sound great. The port may need some tuning. It is currently setup to Accuton's recommended length/diameter for this volume. The crossover at 2200hz works great for these drivers. Hooked up in the office. Overkill for a desk, but they sound great. 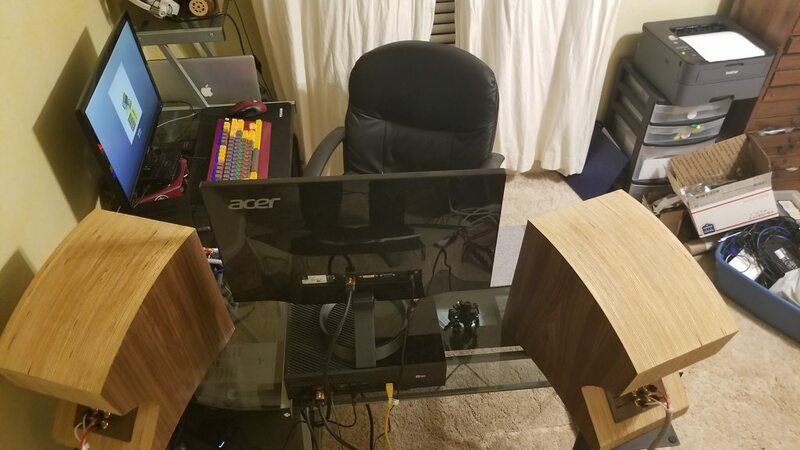 The two-foot design allows them to be set half on speaker stands and half on the desk. They would be better suited to a deeper desk so they aren't quite as close to the listening position. The anvil shape makes them deeper than needs be for the given volume, which makes them harder to fit on this shallow desk. They would fit in well in a larger room as well. For our current living situation they will be at this desk, but may be in a living room in the future. 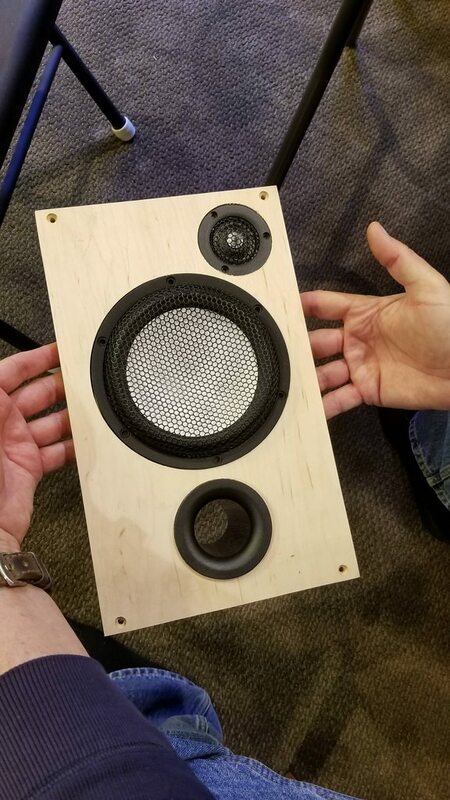 SPL of the left and right speakers measured individually from about 18" with only about 10 minutes of play time. 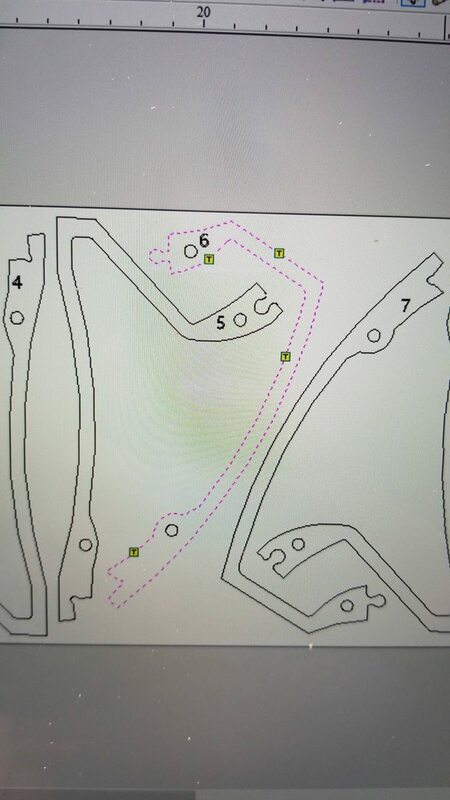 Our hope is that we will get a little more bass response with some port tuning, room gain, and break-in of the drivers. There are no audible phase issues and they measure rather flat from about 150hz up. We will conduct room-style measurements once setup properly. 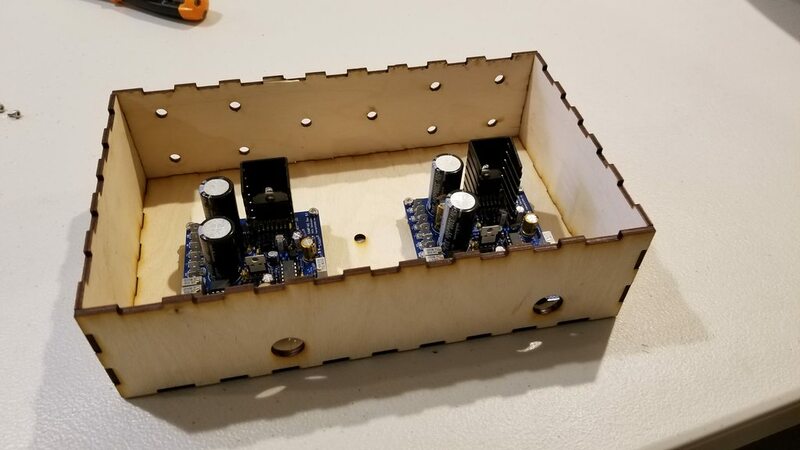 Now that we know that the speakers are working properly and the crossover module is set at a good point (2200hz), its time to get the crossover/amp boards mounted in a box. 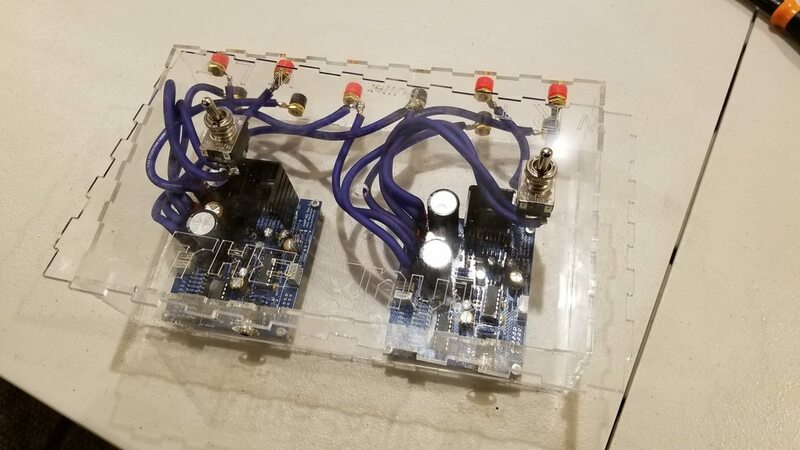 For this project I am using the Xkitz XAMP-M2 This is an initial prototype box. The inputs will come out of the front since the RCA inputs are mounted directly to the board. The power from the power supply and the outputs to the speakers will also come out the back. The prototype box was made from 1/8" ply, which is the same thickness as the acrylic I will use in the final. The final box was cut from clear acrylic on the laser cutter. 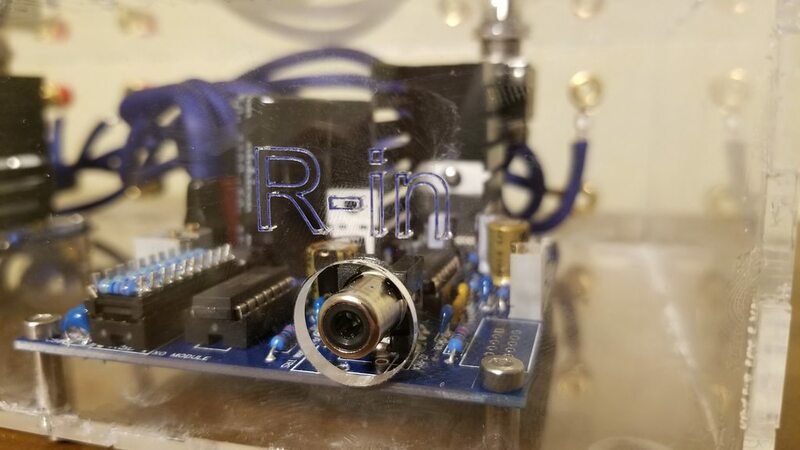 Labels for the inputs and outputs were engraved into the acrylic as well. Here it is all wired up. The 12 gauge we had on hand is a little overkill for such a small box but it worked out fine. The sides and bottoms were glued together but the top is just a tight friction fit. The switches are disconnects for the left and right speakers individually. The disconnects were intended to operate like anti-thump relays, but the thump still is there when the switches are flipped on after the amp powers up. The thump from the amps on their own isn't terrible but I would prefer to avoid it if possible. I revisit this issue later in the project. The scored text was all filled with blue paint to match the boards and wire. It is subtle, but enough to allow you to read what you are doing. Here is how the amp looks on the desk. The power supply is the grey box underneath. The Macbook is fed into the Emotiva DC-1 via USB. The Xbox is fed into the Emotiva DC-1 via optical. The DC-1 operates as a DAC and preamp, as well as a headphone amp for my headphones when speakers aren't an option. The Emotiva sends the RCA out to the crossover/amp. Unfortunately this ASUS monitor is causing noise in the Emotiva which is fairly loud. If the Asus is unplugged the system is silent. I may end up replacing the monitor if I cannot find a way to fix the problem. 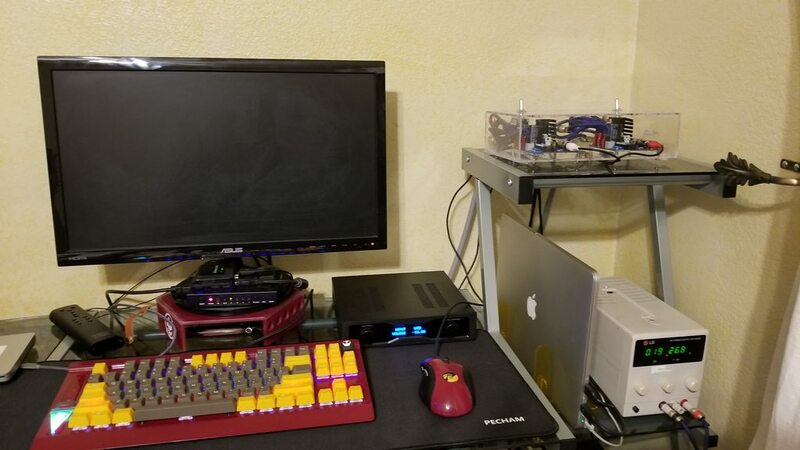 The other monitor and equipment causes no problems. For perspective with where the speakers are in comparison to the amp and how they look approximately from the listening position. 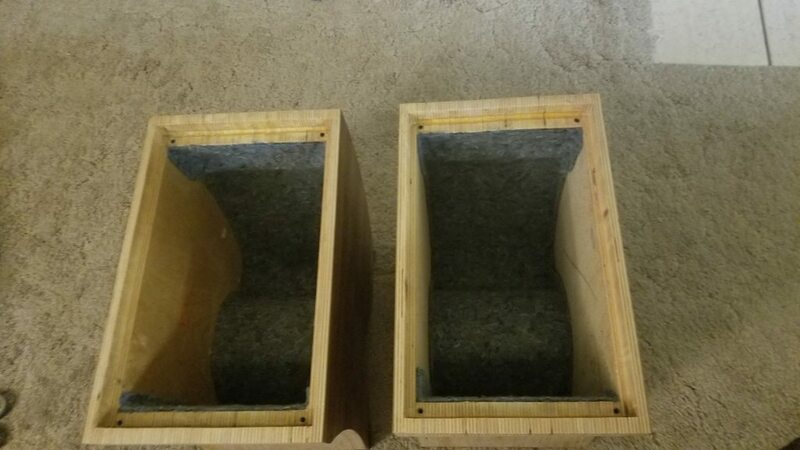 Now besides working on the anti-thump the amp is done and the speakers are ready to be finished. 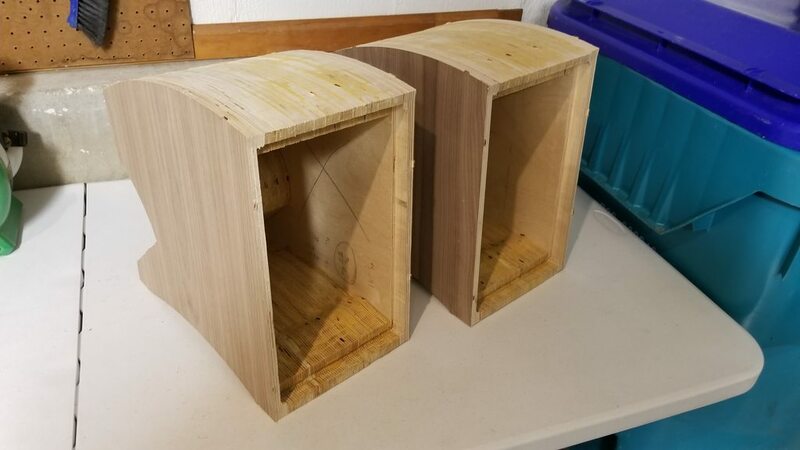 They have been sealed but need several more coats of polyurethane to give them a nice shine and I need to figure out some isolation pads for the speakers to sit on. 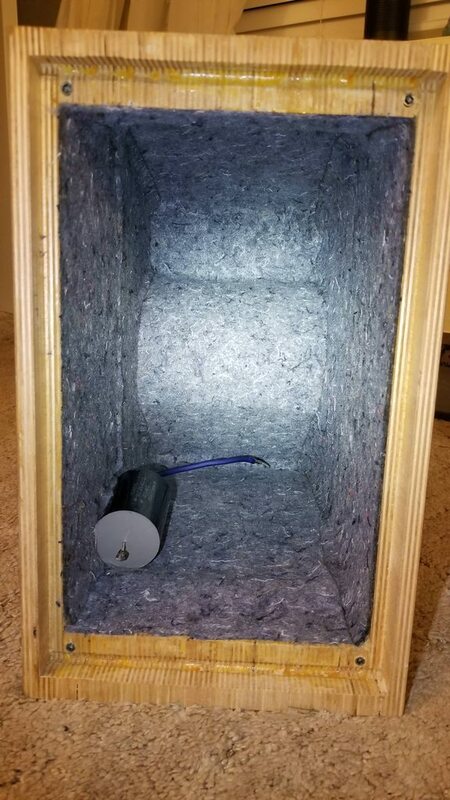 The interior walls still needed felted and the washers for under the baffle and tweeter. I used the vectors from the cabinets to laser cut the felt for the interior so it is the perfect shape, and similarly cut the felt washers. The felt inside fit perfectly and was glued using rubber cement, which makes a nice clean interior. Now back to wood finishing. More spray to get the cabinets glossy. After being sprayed and dried, they will be rubbed down with steel wool and then final coats will be hand wiped. Now that the finishing process in under way its time to solve the amp thump issue. I wanted to avoid tinkering with my expensive drivers so I went to the thrift store and got this old speaker for $0.25. It actually doesn't sound that bad and will allow me to test out my new solution without risking my drivers. I cut off the speaker fabric to see what was underneath better since I don't intend to keep the speaker. The idea is to use a 2-way switch with a center off position on the amp rather than the on/off DPDT i originally used. 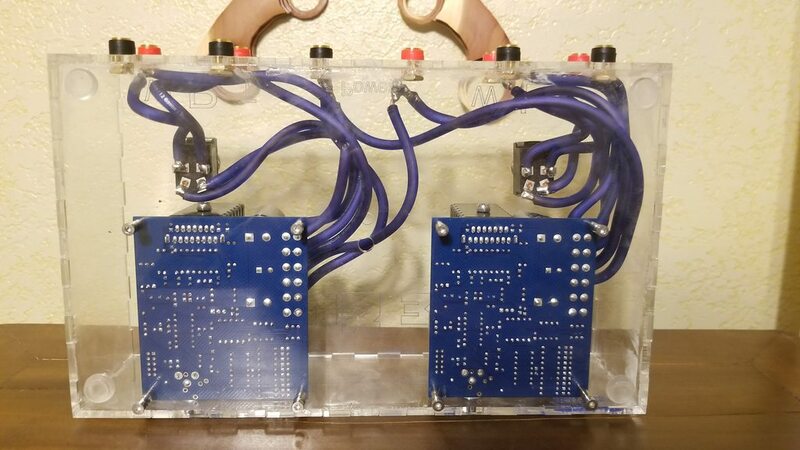 One of the on positions will be wired to a pair of dummy load 8ohm resistors, while the other is wired to the speakers. 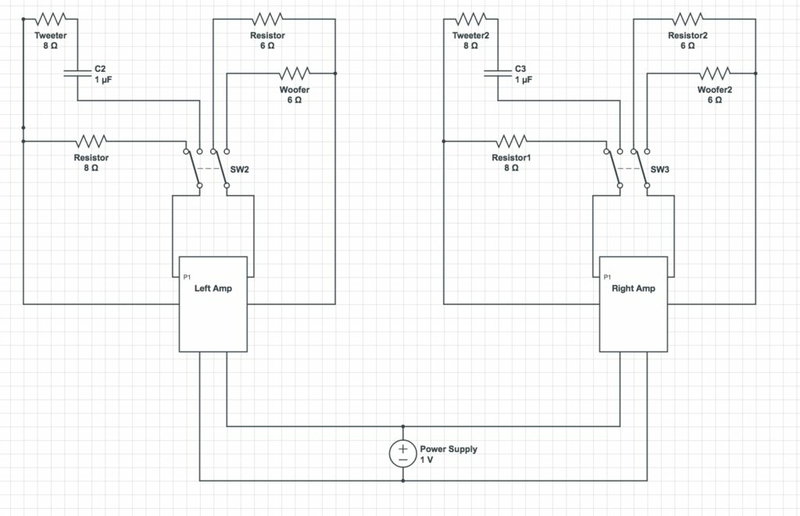 Rough mockup of the circuit (values listed under components weren't changed to be accurate). When the power supply is turned on, the amp will generate the differential but will be in the off position. 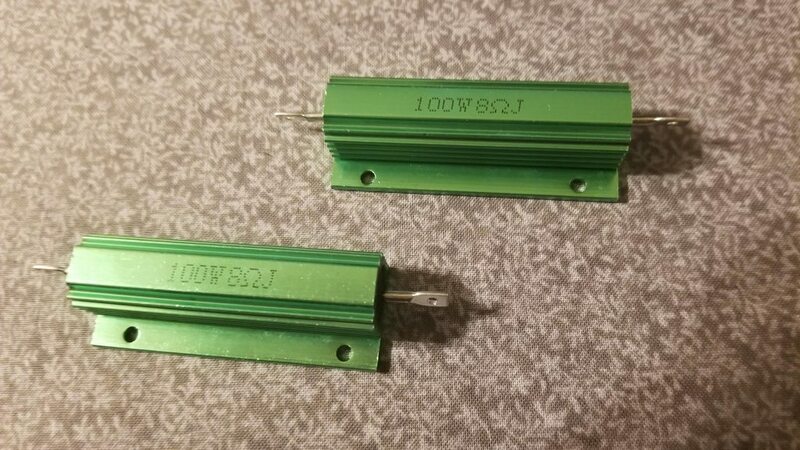 When the switch is moved forward, the dummy load resistors will be placed in the loop and they should absorb the "thump". 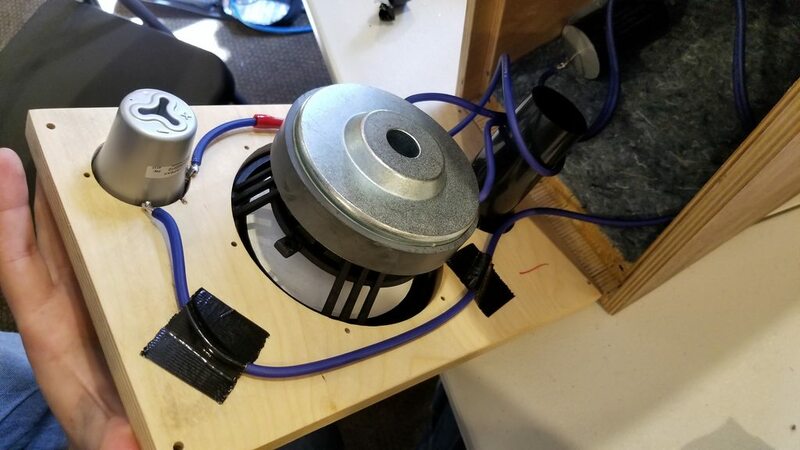 Then with the thump dissipated, the switch will be moved to the rear position putting the speakers in the loop with no thump besides the minor noise made by the switch connecting. In the initial tests, the process works perfectly. At a desk this works fine, but this isn't a convenient solution for a home theater style use. 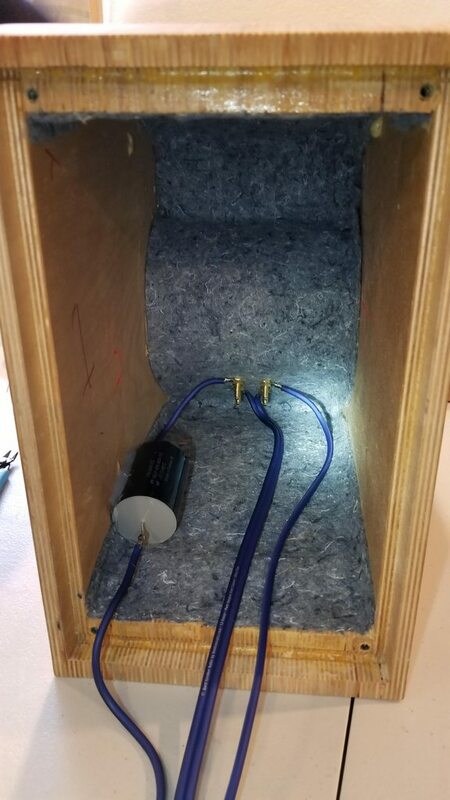 Next steps are to finish the polyurethane, integrate the dummy load resistors into the amp box, reassemble, and tune the port. I will update as I make the final steps. 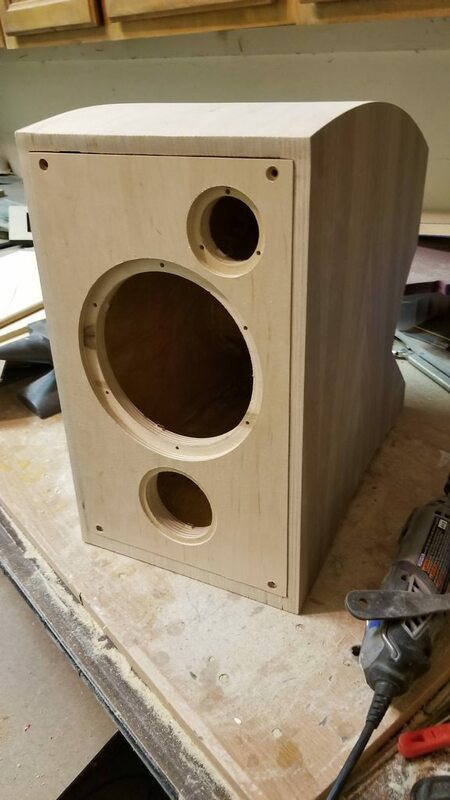 As a first speaker build I have been very happy with the results. I went straight into the deep end with ceramic drivers and custom amplification but I think its been a good experience overall. To get to this point it has been about 45 days, with most work done on weekends. In a subjective comparison, I was hoping to make something that sounded about as good as the B&W 705, which I really enjoyed listening to at our local audio store. We compared the anvil to the B&W 803D3 and a custom set of towers (using Accuton 10", Accuton CELL mid, and Raal ribbon tweeter). The speakers we compared to are apples and oranges but I think the Anvils hold up very well. Probably more fun than the speakers themselves has been the opportunity to drive a couple towns over and spend each weekend with my father working on this project together. I definitely benefited from his experience and tools. I am happy to answer questions or hear constructive criticism about the project. I am particularly interested to hear about port tuning suggestions and about the anti-thump design. I had received a complaint about the sizing of images. My phone and desktop browser dynamically resize images, but for those that don't have a similar feature I resized the images so they should display properly on 720 and 1080 displays regardless of browser. Thanks for letting me know of the issue.